In a panoramic and independent position, in the immediate vicinity of Asti, in Scurzolengo, it is proposed for sale a recently renovated villa, of large size, with swimming pool and surrounding garden. The house is welcoming, thanks to the study of environments that have been well arranged and that allow you to live it to the fullest. Estate close to Moncalvo including a residential building organized into 2 floor and divided into 2 units, an aboveground cellar about 150 sqm that for its height (8 mt on average) and size is ideal for winemaking, adjacent 2 sheds and a third used for equipment and machinery, 7 hectares of land around. In the town center in Tonco, a village located near Moncalvo, it is proposed for sale farmhouse with typical features of Piedmont, completely renovated. The property, of large size, even if it is not standing alone, enjoys an excellent position of privacy. 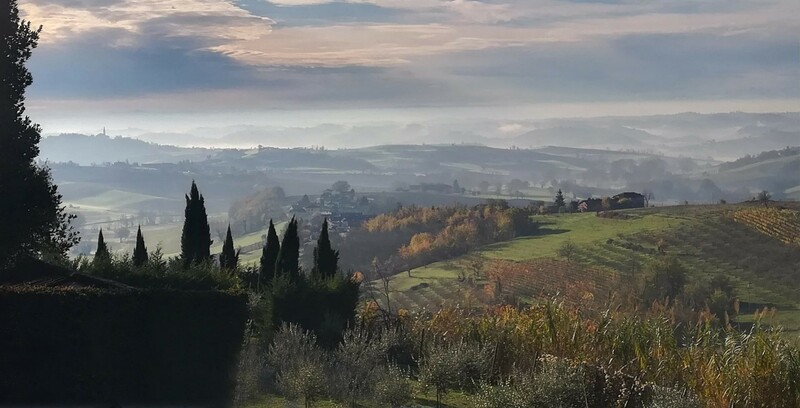 Recently restored farmhouse with accomodation activity, located in a magnificent position, between Casale and Asti, at the top of a hill with a breathtaking hilly panorama. The farmhouse, in traditional exposed bricks has been restored preserving the original features. The house includes residential building, aspacious courtyard with panoramic view, ideal for outdoor dining and receptions, pool and many meters of land around the house. The famous art scholar Noemi Gabrielli defined this villa “wonderful “ for its design, decorations and location. The house is magnificent, organized into 4 floors, (500 sqm every plan), one of these is in the basement. In a peaceful and beautiful green area, overlooking the countryside, traditional farmhouse in process of restoration, located in the little hamlet of Villadeati, a nice borgo with medioeval origins. The house is 300 sqm, it includes residential area into 2 floors, garden about 1.000 sqm., parkng places, a porch directly connected to the living area, a pool. Old traditional farmhouse in need of restoration. A lot of space available, with traditional festures: vaulted and decorated ceilings, cotto floors and cementine, original wooden windows and doors. Outside garden and 5 hectares of land, 3 of which in front of the house. Good solution both for accomodating use, and for big family house which the possibility to develop an agricultural activity. Prestigious villa set in a dominant position of Monferrato countryside. The property is approached by a track leading up through the private park, the villa, about 300 sqm into 2 floors, has been restored preserving the orginal features, as wall and ceiling decorations, fireplaces, cotto floors, wood ancient doors and windows. Located in hilly area, the house has private garden and good conditions. We love Monferrato, where we live and work from decades, giving back life and dignity to the most charming houses located in the area. We select the estates which have origin in a unspoilt landscape, either nestled in medieval villages or dominating the rolling hills, chasing the horizon. We accompany you through the best examples of Monferrato traditional architecture, to turn a desire of beauty into a daily charm for the rest of your life. We cooperate also with an architecture firm and a restoration and building company with experience in our land, in order to support you in the following steps after the purchase, helping you to realize your dream, managing the design and restoration paying attention to your requirements, enhancing the hidden potentials of a house with measures suitable to the contemporary conforts respecting the local traditional architecture. Respecting the simple beauty of the houses in Monferrato, we respect its landscape to leave it to our sons as we have inherited it.